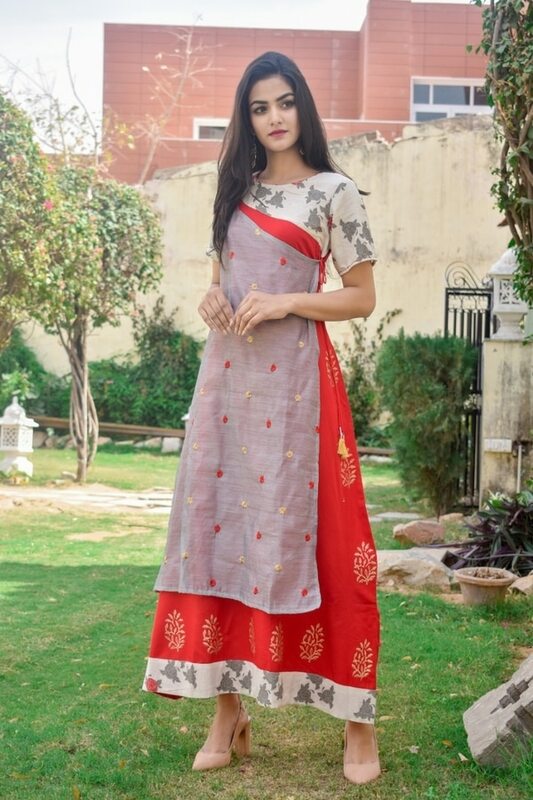 Desi U launches new collection 2019 Flaunt your elegant look as you wear this beautiful long A line multi layered Kurti with chanderi fabric on upper side and manual hand work .. with inner layer of rayon with block print About Desi U: We are one of the best Kurti Manufacturers in Jaipur. We are leading wholesaler and supplier of Branded Kurties, Cotton Kurties, Rayon Kurties, Designer wear, Indowestern etc. We deal in both bulk and single piece selling. Wholesalers, Resellers and direct customers all.are welcomed. We represent epitome of amalagamation of elegant, graceful, classy and quirky women's wear.We believe in quality and customer satisfaction is our utmost priority. Desi U is an combination of indian prints & modern designs to bring out the best of fashion. On one hand, we process Rajasthan's unique textile printing techniques like block printing, bagru print, sanganer print, tie and dye etc. On other hand we use modern technology like digital printing, 3d prints etc. Get our latest, finest and most trendy collection of 2019 at factory prices.